Oakdown is a very attractive, well planned park that will celebrate its 65th birthday in 2016. Run by the Franks family, they and their team continue to work hard carrying out developments in keeping with the environment. The attention to detail is evident at this award-winning park as soon as you arrive and you can be sure of a warm welcome. The park has easy access, beautiful floral displays and a spacious feel. There are 100 level touring pitches arranged in landscaped bays, screened by a wide variety of trees and shrubs and linked by a circular road. All have 10/16A electricity and hardstanding and many have water and drainage. An additional touring area near the golf course, Beech Grove, provides a further 50 large pitches with hedging and 16A electricity. There is a new, fully equipped toilet block here. 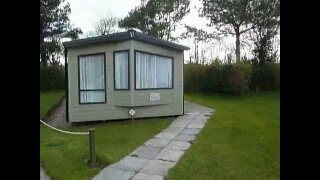 There are separate bays on the park with 16 caravan holiday homes to rent. Oak Grove and Pine Grove are neat areas containing privately owned holiday homes. Waste water is dealt with by a Victorian style reed bed which has encouraged more birds and a hide has been established. The field trail, a haven for wild flowers and birds leads to the nearby Donkey Sanctuary. Recent additions include a lake, dew pond and further wild flower areas, a 9-hole, par 3 Approach golf course and a smart new café/shop. Continual improvements make this park an excellent choice for visitors and especially those with disabilities. 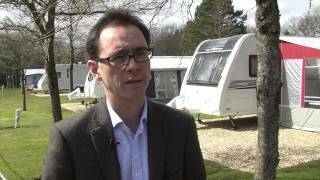 A Best of British group member and winner of the 2015 AA Campsite of the Year. The original central toilet block has been completely renewed. Well maintained, fully equipped and heated facilities include a private cabin for ladies. Two unisex family bathrooms (bath, shower, toilet, washbasin and coin operated entry), double as units for disabled visitors. Laundry facilities plus free freezer and microwave. New facilities in Beech Grove include a room for families and disabled visitors, and a laundry area. Motorhome services. 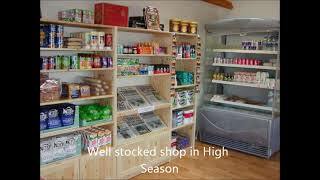 Smart new café/shop selling essentials and snacks (mid May-mid Sept). Internet room. Fax service. Centrally heated TV/pool room with book exchange. Two excellent adventure play areas and castle. Lake. Dew pond. No cycling, skate-boarding or kite flying is permitted. WiFi over site (charged). Caravan storage. Turn south off the A3052 (Exeter-Lyme Regis) road between Sidford and Colyford, 2.5 miles east of the A375 junction and park is on left.